I should probably admit up front that Sam Rivers is an embarrassing blind spot in my record collection. He's someone that for whatever reason, I never really got around to checking out. At various points in my development, I heard, but never acquired, Miles in Tokyo and Conference of the Birds . And I'm afraid I've never even heard his 1960's Blue Notes , even though like everyone else, I've played "Beatrice" at a million jam sessions. But anyway, my first real exposure to Sam Rivers's music came at last year's Vision Fest, where he was being honored with a Lifetime Recognition thingy. First up at last year's hit was Rivers's Florida-based big band, the RivBea Orchestra, which was... well... not the kind of thing I like to hear from a large ensemble. The cavernous sound at Angel Orensanz (a former synagogue with a very high vaulted ceiling) didn't do those dense, heavy clusters and thickened lines any favors. I tried listening from several different vantage points during their set, but the music never resolved itself into anything more than an indistinct blur. I've since heard a few recordings of Rivers's big band works, and those have all been tight and sharp, so I don't know quite what happened last year -- it's very possible that the players were just as stymied by the poor sound as the audience, and couldn't hear each other any better than we could hear them. But anyway, I knew Rivers would be up at the end of the night with his regular trio (with Doug Matthews and Anthony Cole) and I decided to stick it out in the hopes that a smaller group would fare better against the room's reverberant wash. I'm glad I did. The trio's music was everything the big band set wasn't -- intimate, interactive, personable, and lyrical. And if you got in really close, you could hear the music well enough that it was possible to tune out the endless echoing. I started to get a sense of what I'd been missing by not checking out Sam Rivers earlier -- but despite that, I still ended up splitting mid-set, to my everlasting shame. My only defense is that it was coming up on midnight and I hadn't eaten a thing all day, so my brain had literally stopped being able to process any kind of sound at all. I knew I'd kick myself for it later -- Rivers was 82 and lives down in Florida and figured I probably wouldn't have another opportunity to see him perform. But I'm not sure the judge would have considered that sufficient cause for killing and eating the person sitting next to me. But lo, here we are one year later and Sam Rivers is still going strong. Columbia's WKCR organized a reunion of Rivers's beloved (by Destination: Out readers, at least) 1970's trio with Dave Holland and Barry Altschul (i.e., the Conference of the Birds band sans Braxton). This was awesome -- another, hopefully better-fed opportunity to hear Rivers, this time in a venue that doesn't sound like the inside of an aircraft hangar. And together again with Dave and Barry -- damn! Let's talk about those guys a little bit. First off, Barry Altschul -- where the hell have you been? Paul Bley claims to have discovered Barry when he was working as a janitor in a recording studio -- that's probably not quite true, but Barry is definitely a good example of an unorthodox self-taught drummer really shaking things up. I love his playing on those 1960's Paul Bley records, and he hasn't lost his whimsical touch -- at one point, when Dave Holland reached for his bow, Barry whipped out a bow of his own and started scraping on the tines of a Sputnik-like percussion instrument. His time is light, tight, and precise -- the antithesis of Elvin's loose-limbed wide-open feel -- but when they went into an "Equinox"-like vamp, or a Billy Higgins-ish swinging Latin beat, the groove was never in question. He's a master at the brilliantly unexpected choices that make this kind of free interplay work over the long haul -- he would do stuff like creep in with a subtly funky hihat beat underneath what had previously been shaping up to be a plaintive loping ballad. One drum solo ended with a pulp-worthy cliffhanger, and I found myself actually holding my breath waiting to see what would happen next. And his hookup with Dave -- another mercilessly precise player -- was outstanding. 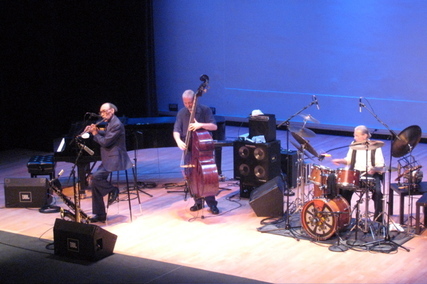 Dave Holland doesn't play this kind of open-ended music very much anymore -- the stuff he writes for his small and large groups these days requires him to be more of an anchor and less of an instigator, but on Friday he was free to roam. His roaming is never quite casual, though -- he's much too much of a methodical player for that. His soloing, with its relentless working-out of all the iterations of a particular motive or idea, owes a lot to Coltrane, and Dave is one of the few bass players capable of approaching Coltrane-like levels of disciplined intensity on the bass. At first, I though his playing sounded a bit stiff and serious next to Barry's impish impulsiveness, but once he had his first showstopping solo under his belt, Dave seemed to relax a bit and settle into the natural ebb and flow of the evening. He and Barry are very good at pacing themselves, hinting at a new idea long before they actually bring it in. By the end of the first set, their transitions had become effortlessly supple. But there was no doubt that Sam was the emotional core of the night. He's now 83, thin and small, and when he plays, he is very still, barely moving except for his fingers. But what you hear is the voice of someone who's spent a lifetime blurring the boundaries between tradition and innovation, inside and outside, melodicism and chromaticism, groove and rhythmic absraction. What surprised me the most hearing him this time was how different he sounded on each of his instruments. His tenor sound is pure old-school, dark and round in a way that you never hear anymore. He didn't so much float over the time as engage in a somewhat cryptic dialogue with the time -- it's like, he heard what Dave and Barry were saying, but he didn't want his own responses to reveal too much. There was an awful lot going on underneath the surface (as saxophonist Dan Blake observed after the show). By contrast, on soprano he seemed more playfully conversational and engaging, on flute his sound was breathy but articulated and emphatic, and on piano he tended towards a flowing impressionism. I found this chimerical approach to playing multiple instruments fascinating -- it's the polar opposite of someone like Eric Dolphy, whose musical identity is unmistakable no matter what axe he's playing. My favorite moments were the quiet, intimate sections where Rivers allowed himself to play some long lyrical lines, or just let a single note hang -- it was unsentimental and heartbreaking. But even when things moved along at a brighter clip, his reflexes seem undiminished by time and he listened like a demon, instantly picking up on fragmentary ideas suggested by Dave and Barry and throwing out his own spin on them. It was also remarkable to hear how well they all remembered what had come before -- at various points in the second set, there were clear allusions to some of the stuff they'd played in the first. The whole thing was thrilling and very deeply moving. And generously long, too -- but this time around, I was able to grab a quick slice between sets. Now all I need to do is fill those Sam Rivers-shaped holes in my record collection. My photos from the hit are here. PS As the FSM is my witness, I swear that I did not compare notes on the show with Nate Chinen, whose own review also just went up. Nice review DJA. Amonsg the blue notes, Fuchsia Swing Song is every bit as good as people say it is, IMO, and a good place to start. Barry Altschul was away in Europe, I believe throughout the '80s & '90s, hence your "where have you been?" I was at this show, and it exceeded my expectations, since I was afraid of a can't go home again result. I saw this trio many times at Studio Rivbea in 1974 & 1975. The empathy was still there, but this was much more low key than the fireworks they would produce at Rivbea. I believe Paragon may be the only officially released recording of that trio, which is a shame.